Cyrus raises £50,000 in one day to fund SoundKey DAC | What Hi-Fi? The British hi-fi specialist was looking for £50,000 of funding through Kickstarter to develop its SoundKey micro DAC for smartphones and tablets. And it has raised the money in a matter of hours. 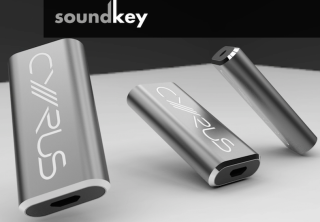 Last month, Cyrus announced it would be turning to Kickstarter to help fund the production of its new SoundKey micro DAC. The project went live on 1st July and has already surpassed the £50,000 goal. Cyrus says it managed to raise the full amount within the first few hours of going live. At the time of writing, the project has raised nearly £65,000. Cyrus has outlined a number of new funding goals on the Kickstarter page, with each goal 'unlocking' a new colour finish. The current finish is black, with blue being unlocked at £70,000. The SoundKey will be made available in a champagne finish if it reaches £100,000. The Kickstarter campaign (here) will stay live until the end of the month, with backers able to secure a SoundKey DAC for 30% less than the retail price. Designed to be a DAC for smartphones, Cyrus claims the SoundKey will score over rival products because it has ultra-low power consumption, so won’t drain your smartphone’s battery as quickly as some other devices. The SoundKey will draw only 50mA current from the phone, around half that of rival products. Audioquest arguably pioneered the micro DAC and launched its own phone and tablet-compatible DAC earlier this year, the DragonFly Black (£89). You can register your interest on the SoundKey microsite and pre-order one on Kickstarter by pleding £69. The project will run until 30th July, with shipping expected to be in November.